Evergreen Resort (formerly McGuire's Resort) in Cadillac Michigan has all the furnishings for mini retreat - be it for business or pleasure. Conveniently located near the intersection of US 131 and M 115, Evergreen offers classic accommodations in an up-north setting amongst 6,000 acres of forest, with Lakes Cadillac and Mitchell nearby. Available on property are 120 rooms (some with jacuzzis and fireplaces), 27 holes of championship golf, tennis and other recreational activities, 2 putting greens , a grass driving range, a fitness center, and an indoor pool area with jacuzzi and sauna. Convenient packages are available year round for golf and winter activities, which include cross country skiing, sledding, snowmobiling and more. Dining options includes Curly's Bar and grill and upscale facilities at the Terrace Room, which is wonderfully appointed and features a great variety of fine cuisine. Nearby, Lakes Cadillac and Mitchell are well known hot spots for walleye and bass, and also provide ample opportunities for swimming and boating. Mountain biking and hiking trails abound, and roller-blading is a popular activity in town during the summer season. With year-round great rates - this is an ideal resort for families and golf junkies alike. Business travelers will appreciate the corporate accommodations, and professional amenities. Click here for more information on Evergreen Resort. 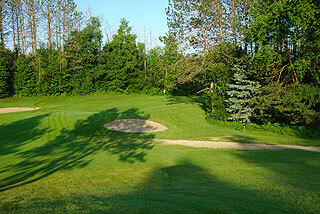 The Spruce Golf Course is a classic design, that plays to 6438 yards and a 124 slope rating. With 3 sets of tees (whites -6094 yards and a 120 slope and reds at 5077/118), Evergreen fashions a resort golf experience, that can be enjoyed by all levels of players. 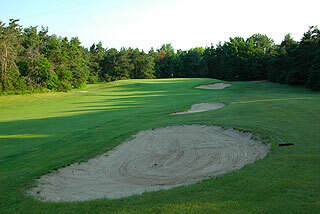 The terrain features a mix of flat and rolling fairways, with some very interesting holes. We found that the course would actually play quite easily, except for the scattered pines and hardwoods that intrude on the fairways, making shot placement off the tee a priority. Four par 4's play at 400 plus yards, with 3 more at around 390 - and provide ample opportunity to use driver off the tee. The tee boxes and fairways are well maintained, and the medium sized, mildly undulating greens are some of the most consistent putting surfaces in the state. Red, white, and blue flags indicate the day's pin placement, and yardage plaques plus a 150-yard stake provide ample measurements from tee to green. Greatly appreciated are the hole diagrams at the tee areas and also on the scorecards. For those staying on property, the course is right outside your door, as you tee off merely a couple hundred yards from the accommodations. The opening hole provides a wide, rolling fairway with a tight approach to a narrow green, tucked into an elevated perch with small traps nearby. On the 405 yard par four second, which is also the number one handicap, it is necessary to drive past the right fairway bunkers to have a clear shot at the green on the approach. Anything more than 170 yards away on the second shot will present a blind entry. The par three 3rd is pine-lined and quite pretty, with bunkers on each side, and is followed by another hole that bends right to left. Distance is required off the tee, as the most opportune landing area is past the 150 yard marker on the right. The par 3 fifth is also beautiful, but can play extremely tough if the wind is up. A stream and pond immediately in front of the putting surface create a need for accuracy off the tee. Six and seven are a couple of mid-range par fours that play fairly straight along rolling fairways. Mature trees near the greens make approaches difficult on both of these holes. The left side of the fairway is the prime landing area on the short par five 8th, which is heavily bunkered and narrows considerably. Long hitters can reach in two here. 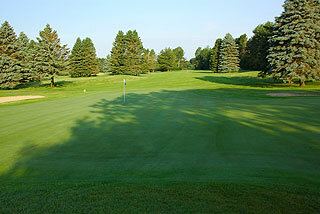 The finishing hole on the front presents a straight and narrow fairway, lined with blue spruce and red pine. 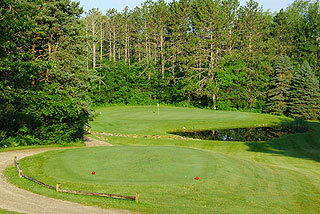 A pond just right of the green is not readily visible from the fairway - check out the hole diagrams! The back-side features water hazards on five of the first six holes. The tenth is straight with lots of room - and is one of those holes that would play very easily if not for the scattered pines in the fairway. The huge putting surface slopes noticeable from back to front. The same is true of number 11, though a daunting willow guards the entry to the green, with a small pond short left. 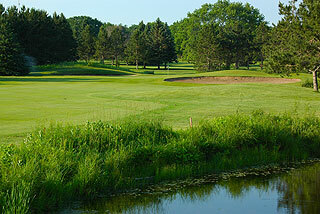 The water hazards on both 12 and 13 should not come into play, unless shots are badly shanked. They provide some aesthetic beauty, and can be a nuisance if the wind is up. The 14th bends to the left, enticing long hitters to cut the corner by driving over the water hazard. The fairway in this area is merely 20 yards wide - making the area just left of the huge Oak the most advantageous driving position. If you land it on the fairway, an easy approach on this number 2 handicap is waiting. Fifteen bends in the opposite direction, with a pond on that side discouraging long hitters from trying to cut the corner. A lay up just past the bunkers on the left will leave a good second shot - which could possibly reach the green for a great eagle or birdie try. This par five plays just 447 from the white tees. There are trees all over the place on 16, which is the longest par four on the course, at 420 yards. Seventeen is short in actual distance, but plays 50 yards or so longer, as it is entirely uphill. 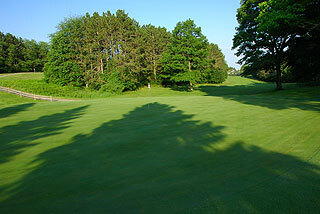 This precedes an easy finishing hole - a straight away par three, which slopes off on the right near the putting surface. 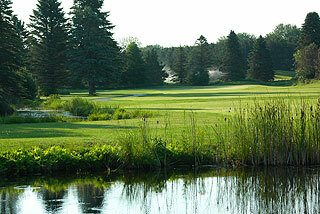 The Spruce is the 18-hole championship layout, and is complimented by the nine-hole Norway Course, which plays to between 2792 and 2358 yards. 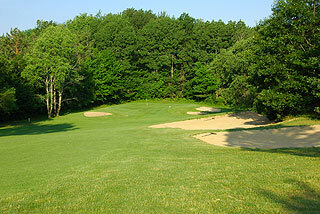 This course is similar in topography, but with wider fairways and less intrusive foliage and trees. For those looking for a resort golf experience, the Norway provides ample opportunity for high handicappers and casual golfers to enjoy the game. The slope rating here is 98 - 99. One of the amenities missing at many upscale golf resorts is a layout that is user-friendly to beginners. The Norway provides this amenity, and also is a pleasant experience for seasoned golfers looking to work in an extra nine. A stay at Evergreen affords the opportunity to relax in comfortable accommodations, to enjoy resort amenities, and to play with friends and family. This is a great resort for business travelers and conference groups as well.